Death Metal and Grindcore have become a great vehicle for political ideas and allows discussions of certain topics to be expressed musically and palatably for eager audiences. Just as Punk addressed the harshness and trials of day to day life in the Thatcher/Reagan era throughout the 80's, Death Metal lends itself well to approaching the issues that cause us so much dread and misery in the twenty first century; from impending apocalypse to war to poverty to divisions of wealth. Ever since NAPALM DEATH released their first two, legendary albums, it seems that there are dozens of bands of the same ilk who aren't afraid to speak loudly about how various world governments, organisations and entities that have been metaphorically sodomizing not only their own charges, but those of other nations with their under-handed, corrupt actions. 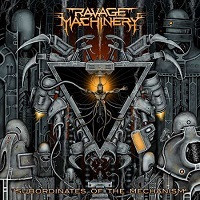 Finland's RAVAGE MACHINERY follow in the footsteps of these great predecessors, and their newest record, "Subordinates of the Mechanism", blends ferocious, catchy music with lyrics that allude to the dystopian hell that these structures have laid out for our immediate futures. The opening moments of the album already cement it as a tour de force of brutality which reflects the lyrical themes approached within it. "Emancipate/Exterminate" practically bursts out of the speakers in a blaze of aggression, leaving an immediate impression on the listener and setting a lofty bar for the rest of the record. Likewise, "Supremus Deus Machinarum" is a cacophony of speed-driven, ferocious music with plenty of technical flourishes that are well placed and provide plenty of great hooks. "Evolution of Malevolence", built around a powerful riff and punishing drums, sounds absolutely great. The guitar lines are played confidently, and the thick, tar-like vocals that accompany the music sound immense. Then we come to "Miscarriage" and "The Utilitarian Nomad", two songs that are not only aggressive and groove-laden, but also filled with dozens of hooks and plenty of brutality that's sure to make each respective track a fan favourite in the future. The latter is clearly more in line with the Brutal Death Metal sound, without sounding like a carbon copy of any given band, making it a welcome change from the vast majority of music coming out of this subsection of the scene at the moment. "Limits of Systematic Madness" is a decent, mid-paced affair with much heavier, rhythmic riffs as opposed to the sort of melodic hooks that have featured on the previous two songs. The very slight, Blackened edge of "The Gallows Await" is really interesting, and adds another dynamic to the bands sound. The heaviness is still noticeably there, but this particular element being thrown into the mix makes this song stand out, and makes it one of the best tracks on the album. By the time we get to "Mediacracy", the album is beginning to wind down towards its final moments, but this brutal, speed-driven track helps draw your attention and bring this record to its climax. The final offering, "Decapitation", might just be the most ferocious on the record, a slab of thick, vicious modern Death Metal with really great performances on all fronts. It's a great end to a decent record. The music on here definitely belies the lyrical themes on offer. The heavier end of Metal has a tendency to lend itself well to these topics, and this instance is no different. If I have any criticism of this record, it's that at times it relies a little too much on the "Brutal" side of the genre, when it doesn't have to be as heavy and overwhelming as possible to leave its mark on the listener. If you like the darker and more politically charged side of Death Metal, then I'd thoroughly recommend this to you.